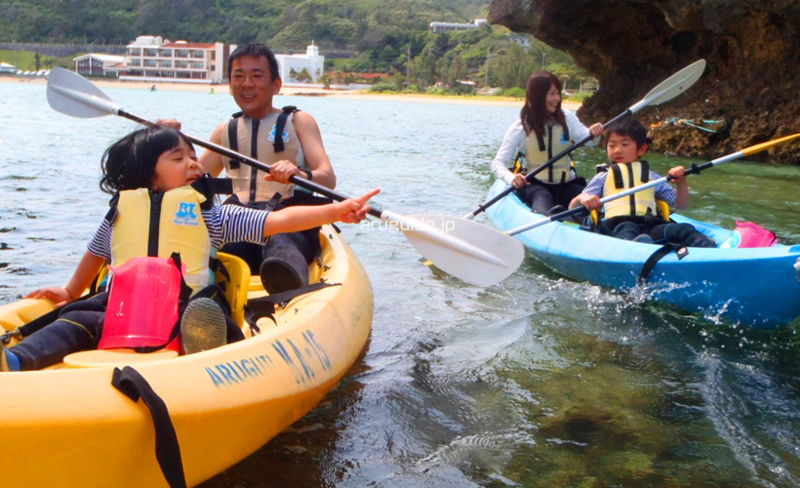 We offer you the chance to witness the beauty of Okinawa’s oceans with our Blue Cave and Sea Kayak tours. 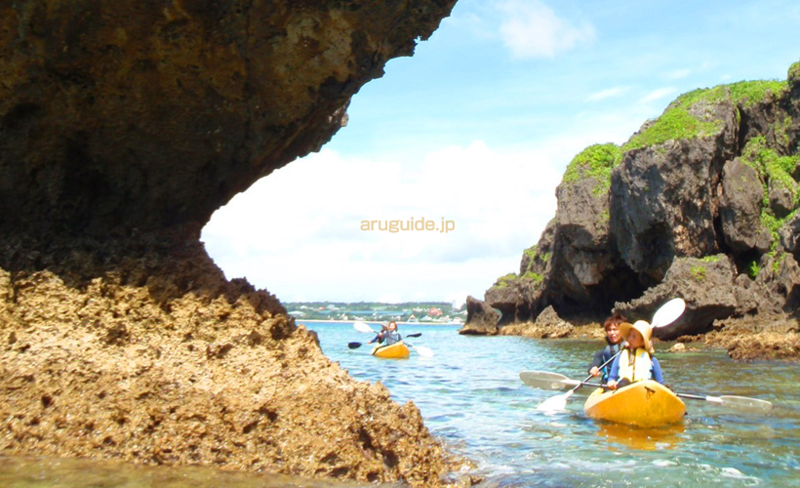 Aruguide Okinawa is located on the beach.From the beach we will start our tour. 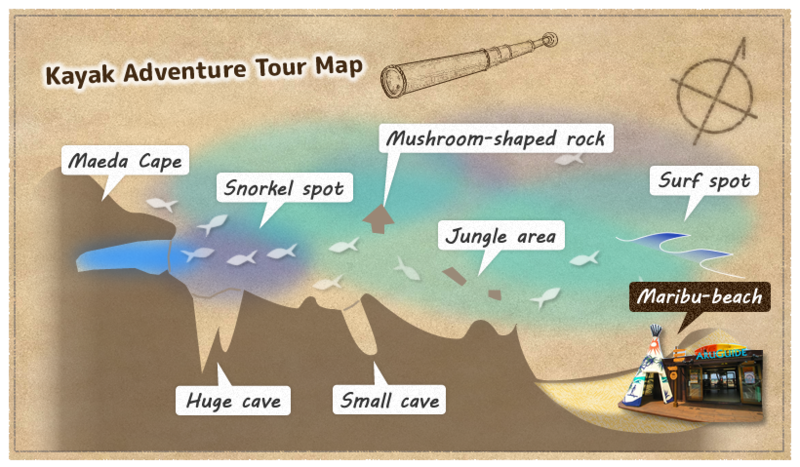 This adventure will make you discover the secret beach,the rocks in the ocean, the big cave and many other things. Depending on the sea condition there are always different sites to go to. During the trip we will discover different rocks with different shapes and we will continue to enjoy the cliffside. Children must be at least 1 year old and there is no age limit as long as you are healthy. You will experience the cliffside from the bottom and it is so impressive. If there are no waves, there are many places where you can admire the coral. The closer we will get to the big cave the more it will surprise you. Close to the big cave it becomes shallow, so you will start to see the fishes everywhere. Arrived at the big cave we will leave the kayaks and get in to take a break. 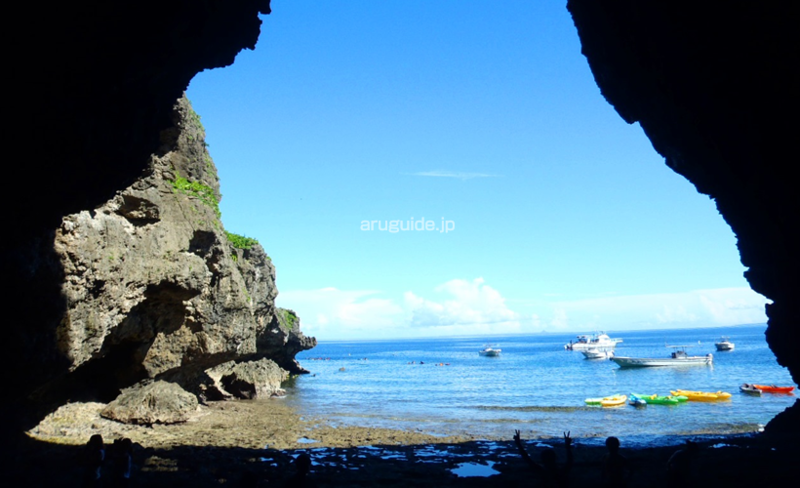 From the inside of the cave you will experience an amazing scenery. Have fun in a big cave and on a secret beach in Malibu. ※We can adjust the check-in time according to your schedule. Please contact us if you require a later or earlier check-in time. ・Bring an extra T-shirt as you may get wet on this adventure. Swimwear can be worn underneath. 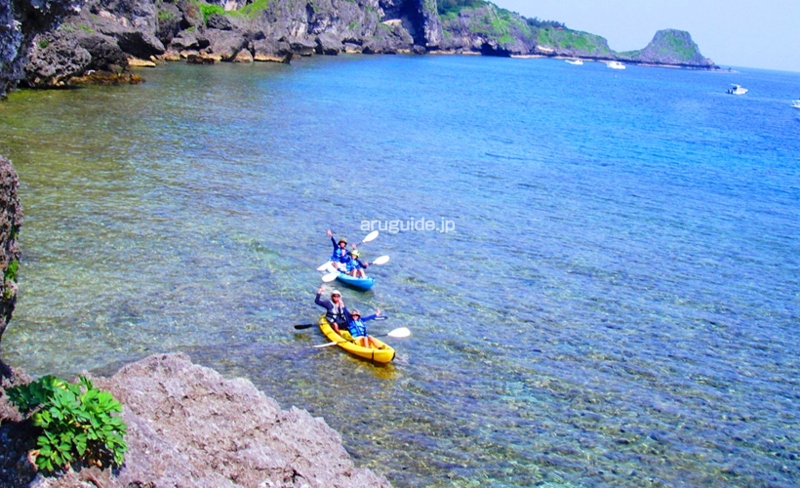 ・Bring an extra T-shirt as you may get sunburned and wet on this adventure. (When we go kayaking, we will take off wet suits down to the waist, so our upper bodies are likely to see a lot of sun and get wet.) ※We supply free marine boots. ・Course content is subject to change, based on weather or sea conditions. ・If you wish to take pictures during the adventures, we recommended you use a water-resistant camera. For safety do not bring your cellular phone, you might lose or break it. ・We offer our customers to remember and share those unforgettable memories with a CD of pictures taken during the adventure by the guide. ・If you are under treatment or currently ill, please check with your doctors if you can join any tour we propose and ask him to write a medical certificate. ・Pregnant woman are not allowed to join any activities. 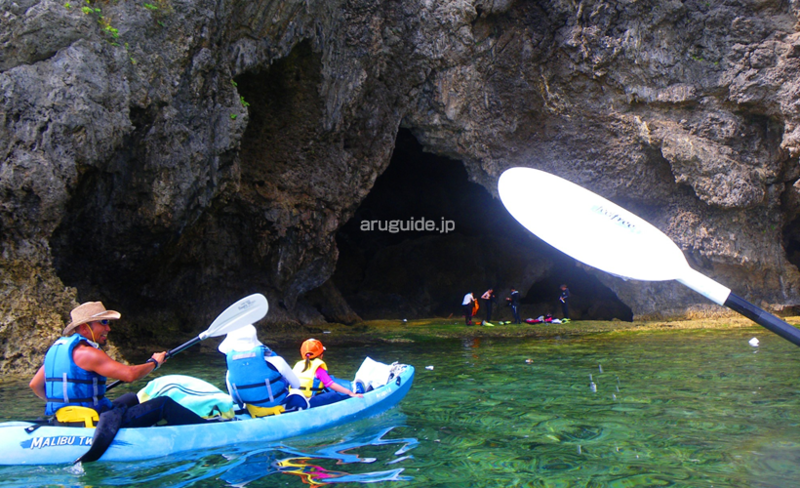 We propose to our customers unforgettable adventures,kayaking and snorkeling in Okinawa's famous Blue Cave. We are a team of professional guides ready to share our knowledge with people from Japan and abroad. About Aruguide Okinawa We wanted to build Aruguide Okinawa with simple and, as much as we can, from recycled materials to be in touch with nature. From our shop you can dive in the ocean under 5 seconds. We have a huge parking in front of the shop, you can use our free showers, changing rooms or even our hair dryers. We enjoy providing the best service for our customers. After your adventures come and relax in our cafe. 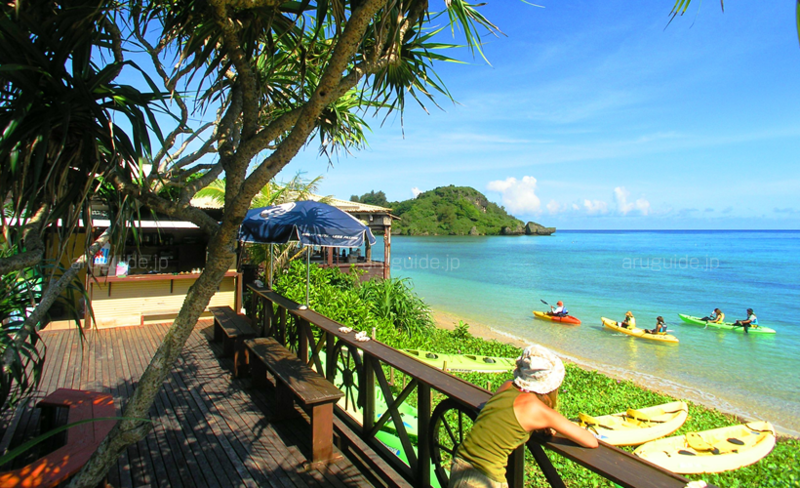 Tipi cafe～malibu beach～ Aruguide Okinawa is located on Malibu beach, so we opened a cafe-restaurant with view on the sea named "Hamabe no Tipi Cafe" How about a relaxing time having lunch or a nice cup of coffee right in front of the sea?